The Regional Transportation Authority of Northeastern Illinois (RTA), the Village of Oak Brook, the Greater Oak Brook Chamber of Commerce, and Chariot have teamed up to launch a new weekday microtransit shuttle route to connect commuters from the Metra station in Elmhurst to 10 commercial properties along and near Commerce Drive in Oak Brook. Acting in its role as community connector, the Greater Oak Brook Chamber of Commerce identified and engaged 10 multi-tenant properties in a densely populated area, allowing local companies and their employees to jointly benefit from the RTA and properties’ investment in the project. The pilot is a first-of-its-kind public-private engagement with a microtransit company in the RTA region. 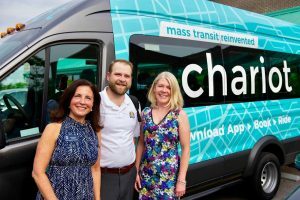 The project uses Chariot’s service to address the first- and last-mile commuter challenge and leverages the support of local employers who wish to offer more transportation options for their employees. Rides are provided both to and from the 10 properties and the Metra station. 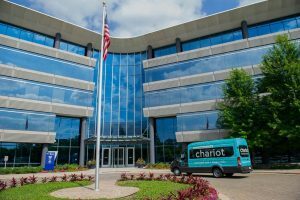 The 14-passenger Ford Transit vans are outfitted with free WiFi and driven by Chariot’s W-2 employee drivers. Users can reserve a seat up to 45 minutes in advance on the day of their ride via the iOS or Android app and meet their Chariot outside the Elmhurst Metra station or outside the properties for a ride to the Metra station. Tenants in the participating Oak Brook properties ride for free, and other passengers can ride for the price of $6.30 per ride. 10-ride passes are also available for $58 (a $5 discount), and new riders may use the promo code “oakbrookfreeweek” for a free week of Chariot rides. The pilot program is scheduled to run for up to two years. In the first year, 80 percent of the funds will come from RTA, and 20 percent from participating property owners. In the second year, each party will be responsible for 50 percent of the cost. The first rider was Sandro Plamp, an energy efficiency engineer who heard about the service while he accepted a position in Oak Brook and was determining how he would commute to his new job. Millennial workers aged 18-34 make up about a third of the region’s workforce. They are multimodal and increasingly not as interested in getting their drivers’ licenses. 2016 data from Governing Magazine show that 28 percent of households in the city of Chicago have no car. The Regional Transportation Authority (RTA) is the transit agency charged with regional financial oversight, funding, and transit planning for the Chicago Transit Authority (CTA), Metra and Pace bus and ADA paratransit. The system provides more than two million trips each weekday on the RTA region’s transit system in six counties with 7,200 transit route miles throughout Northeastern Illinois. The Agency also provides customer services including online and telephone travel planning assistance and travel training for seniors and people with disabilities. For more information, visit www.RTAchicago.org. Chariot is reinventing transportation with a microtransit solution that is fast, reliable and affordable for people living in today’s cities. Riders can easily reserve a seat on a Chariot via the iOS or Android app, and hop on one of the company’s 14-passenger Ford Transit vehicles operated by friendly, professional employee drivers. After launching in San Francisco in 2014, the company participated in Y Combinator’s Winter 2015 class and was acquired in September 2016 by Ford Smart Mobility to serve as the cornerstone for its global shuttle services business. Chariot runs more than 100 daily routes serving San Francisco, New York, Austin, Seattle, Columbus and London. For more information, visit www.chariot.com. The Greater Oak Brook Chamber of Commerce is a 501(c)6 business association governed by a board of directors comprised of executives from Greater Oak Brook companies representing a wide range of industries: small businesses, Fortune 500 companies, financial institutions, hospitality and retail businesses, technology companies, commercial real estate firms, and more. 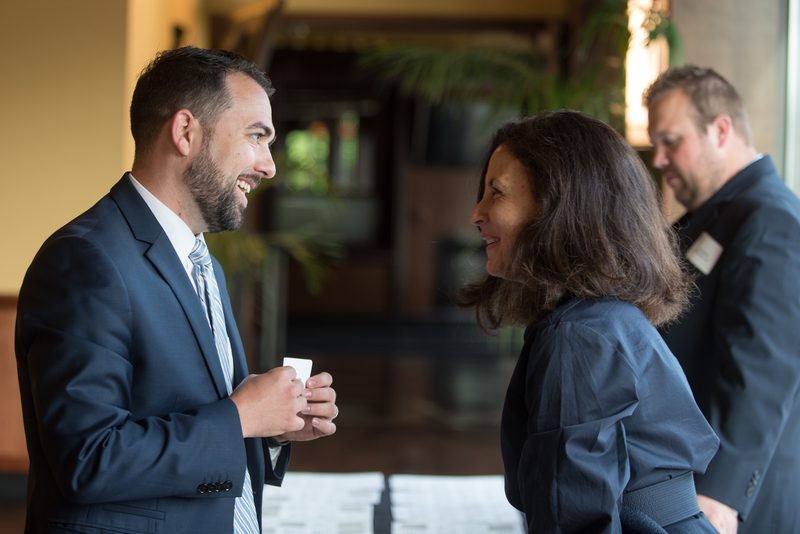 The related Greater Oak Brook Chamber Economic Development Partnership is a 501(c)(3) charitable organization that brings Oak Brook and Oakbrook Terrace businesses and government together to understand and address the economic needs of the Oak Brook area. The EDP conducts research, gathers and analyzes data, publishes information, and coordinates activities on behalf of Oak Brook and Oakbrook Terrace to attract and retain businesses and employees, support commercial revitalization efforts and transportation and infrastructure improvements, and attract and retain a skilled workforce. For more information visit OBChamber.com and GreaterOakBrookPartnership.com.